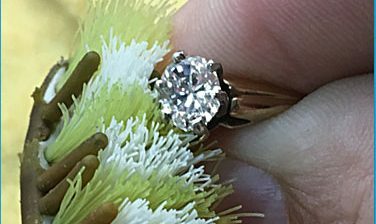 Can fluorescence affect diamond value? It absolutely can. Fluorescence can affect diamond value. Let’s start of with a brief description of fluorescence. It occurs in approximately 30% of diamonds and it’s the characteristic of the diamond glowing under UV light. The majority of the fluorescence has blue hue, but on rare occasion can emit a yellow or orange fluorescence. There’s all kinds opinions and counter opinions on fluorescence. Here’s the biggest truth bomb of all of those opinions. Chances are likely that not one of the experts will ever pay you more because your diamond has fluorescence. 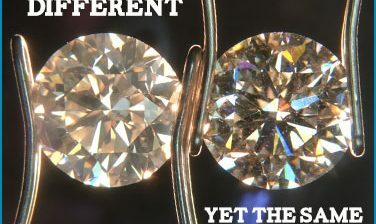 Diamonds in the color range of D-H have a negative percentage attached from 15% to 1%, the less color that a diamond has, the more fluorescence hurts the value. Another factor is the intensity of the fluorescence, fluorescence has 5 degrees from none to Very Strong. 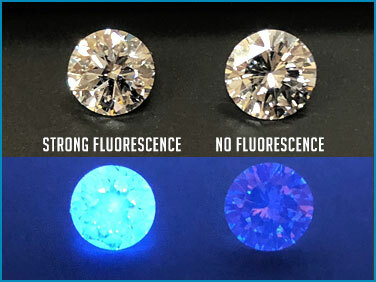 Most folks wonder why fluorescence hurts the value of colorless diamond more than a slightly tinted diamond. It’s has to do with the visual effect. Sunlight carries about 3% of the UV spectrum of light. That means that if you have a diamond with strong fluorescence, that direct sunlight will have a very slight effect on the visual color of the diamond. Now that’s important to note, because it will make a colorless diamond, appear more blue – which is not considered a good thing. Yet, on the other hand, a diamond that is less white, possessing more yellow (nitrogen), the fluorescence can make diamond appear whiter. It’s basic color theory, technically the opposite (complimentary) of blue is orange, when you mix complimentary colors both hues are diminished to “neutral gray.” Though the lesser white diamonds have more of yellow characteristic than that of the color orange, the blue fluorescence will give the visual effect of a whiter stone in the sunlight. That all sounds well and good with the lower color grade stones, but that isn’t the only effect of fluorescence in diamonds. The big nasty effect of a diamond with a stronger fluorescence can come across as a milky, cloudy, foggy or even oily appearance. Those characteristics are not desirable on any color grade. GIA states that the clarity effect is pretty rare from fluorescence (like 3% of fluorescent diamonds carry this attribute), but we’ve seen so many diamonds that we think strong-very strong fluorescence diamonds may have a slightly higher percentage. Though the glowing characteristic does affect the value, we still quote and purchase diamonds that have fluorescence. The secondary issue of visual milky, cloudy, foggy or even oily effect is a serious concern when selling your diamond. We do not purchase them. They are extremely difficult to sell in store when compared to another diamond that doesn’t have that same clarity characteristic. When sellers submit a diamond with fluorescence for us to make an offer on, we are clear that offer is valid if the stone doesn’t have the milky, cloudy, foggy or oily effect. 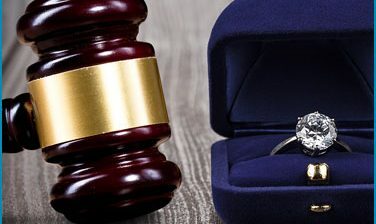 Fluorescence as a whole will not affect the resell value of your diamond, that’s because it should have been priced accordingly at the original purchase. That’s of course as long as you originally bought your diamond from a reputable source. The stones that visually appear milky, cloudy, foggy or even oily will have a significantly less purchase price associated with them (as well as the resell value).